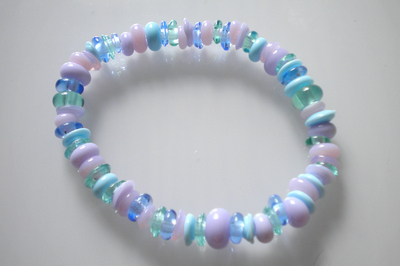 'Pastel Dream' bracelet from the pebble stack range. Delicate, tactile, glass bead bracelet. Stunning gift. Tons of tiny Lampwork beads, disk shaped and round, on a clear nylon stretch elastic. Bracelet colours can be chosen and made to order, allow 2 weeks for this. Please email this service. Bracelets come gift wrapped in an organza bag.